Sources in Hamas have disclosed that Iran is renewing its substantial influence on the movement after a visit by a Hamas delegation headed by Hamas Political Bureau member Mohammed Nasr to Tehran at the beginning of this month. Hamas attributed great importance to the meeting. The delegation, dubbed “high-level,” included three additional members of the movement’s Political Bureau – Osama Hamdan, Maher Obeid, and Jamal Issa. The group was joined by Hamas’ representative in Iran, Khalid al-Kaddumi. 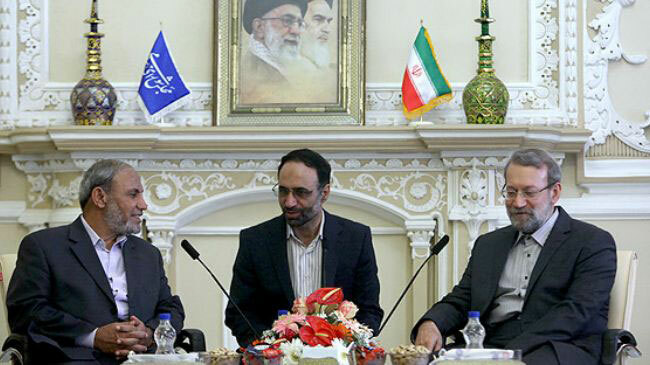 The talks with senior Iranian officials were described as “warm,” and included a meeting between Hamas members and Ali Larijani, chairman of Iran’s Shura Council. Discussions focused reportedly on the situation in Jerusalem, the ongoing blockade of Gaza, the repercussions of Operation Protective Edge, and the rehabilitation of Gaza. Hamas’ distancing from Iran occurred in 2011 after Hamas took an anti-Syrian stand in the context of the Syrian civil war. During Operation Protective Edge the controversy within Hamas came to the fore. Of the two main camps, one, headed by Political Bureau chairman Khaled Mashal, favors the Qatar-Turkey partnership and the Muslim Brotherhood (the Sunni axis). The other, led by senior Gaza-based figure Dr. Mahmoud al-Zahar, supports the Iran-Hizbullah (or Shiite) axis. This camp includes the heads of the movement’s military wing, the Izz a-Din al-Qassam Brigades. The revival of Iranian influence over Hamas stems from the weakening of the Muslim Brotherhood in Egypt since the downfall of President Morsi and the designation of the Brotherhood as a “terrorist movement” by the new regime headed by President Abdel Fattah el-Sisi. Moreover, while receiving large-scale aid from Iran in the form of money, weapons, and military instruction, Hamas has received mainly promises from the Turkey-Qatar axis. Al-Zahar, who enjoys Iranian support, takes a militant line against the Palestinian Authority. In a speech a few days ago he accused the PA of collaboration with Israel. The Palestinian Authority fears Hamas renewed subversive activity, as in the recent attempt to overthrow Mahmoud Abbas’ rule that was thwarted by Israel’s Shin Bet (or Israel Security Agency), which uncovered an extensive infrastructure of Hamas operatives who planned a series of attacks on PA institutions aimed at undermining Abbas. In his latest speech al-Zahar promised that just as his movement has taken over Gaza, it will take over the West Bank and establish security and police forces there, arousing great concern among the Palestinian leadership in Ramallah. In recent weeks, Hamas has carried out several test firings of rockets toward the sea, and its senior officials have threatened to go back to firing on Israel if the rehabilitation of Gaza is delayed. Hamas’ resumption of ties with Iran may involve preparations for a new offensive against Israel and a desire to reshuffle the deck because of the movement’s distress amid the tensions with Egypt, the deepening rift with the Palestinian Authority, and the difficulties in rehabilitating Gaza. The reestablished ties with Iran may also reflect Hamas’ wish to influence the results of the elections in Israel.